Let’s talk about healthy eating for a second, shall we? 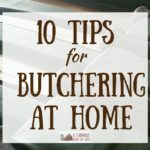 Because even as homesteaders, we sometimes need to be reminded how to eat like a homesteader. (Or maybe it’s just me who gets caught up in convenience and ignores the fact I’m basically living in the middle of an elite grocery store?) 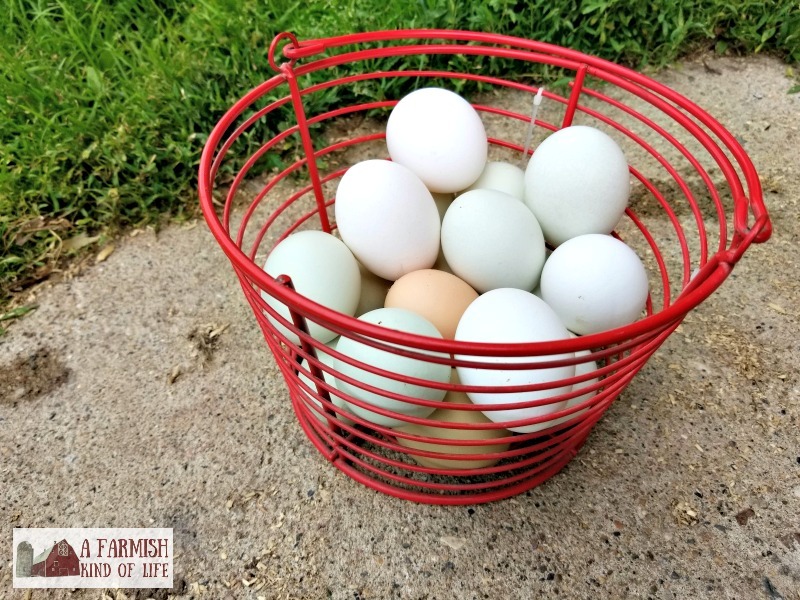 So today I’d like to share with you a super simple homesteader diet that might keep you on track with making the right food choices most of the time. Please don’t let the word “diet” freak you out. This isn’t complicated at all. I’m not selling anything, there’s no app or book or 21 day meal plan here. I’m just talking about how I have learned to frame food and meals in my mind as a homesteader. And if it helps you, too, that’s awesome! a) Not eating more food than you’re using the energy of. In other words, moving your body more than you’re shoving things in your mouth. b) Eating decent food. Not basing the majority of your food consumption on Oreos and boxed macaroni and cheese. Now there are a million and two different eating plans out there and even though they basically boil down to points a and b above, people all need different framework to get there. Some people count calories, some people count carbs, some people focus on eating from certain food groups in certain ratios…there are lots of different options for calculating and following a weight loss/diet thing. In the past, those things have worked for me—for awhile. And then I get frustrated. Mostly because I’m a bit of a perfectionist and if I miss a day of logging stuff into an app or go over my calorie count because there was a birthday party, I’m pretty sure I’ve ruined my entire body, have failed at The Diet, and I make myself feel better with ice cream and marshmallows in ridiculous proportions. Yes. Me. That girl that has that one farmish homesteading blog. 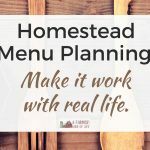 So I got to thinking, since some people need to “frame” their way of eating differently—author included—awhile back I started thinking about my eating as the homesteader diet — and my daily food choices need to focus on three things: food from the garden, food from the barn, and food from the kitchen. I think I’m on to something. Hear me out. I’m talking produce from a garden, orchard, etc. As a homesteader, hopefully that’s your garden or orchard. But as a Minnesota gal, believe me—I understand we can’t all grow all the things. So eating from the garden means making sure you’re taking in fruits and veggies (fresh, frozen, canned/jarred) from your garden, or someone else’s—which includes the grocery store. Obviously the closer that garden is to being your own garden, the better. But when it comes down to it, choosing to eat peaches or kale from the store is better than Twinkies, right? 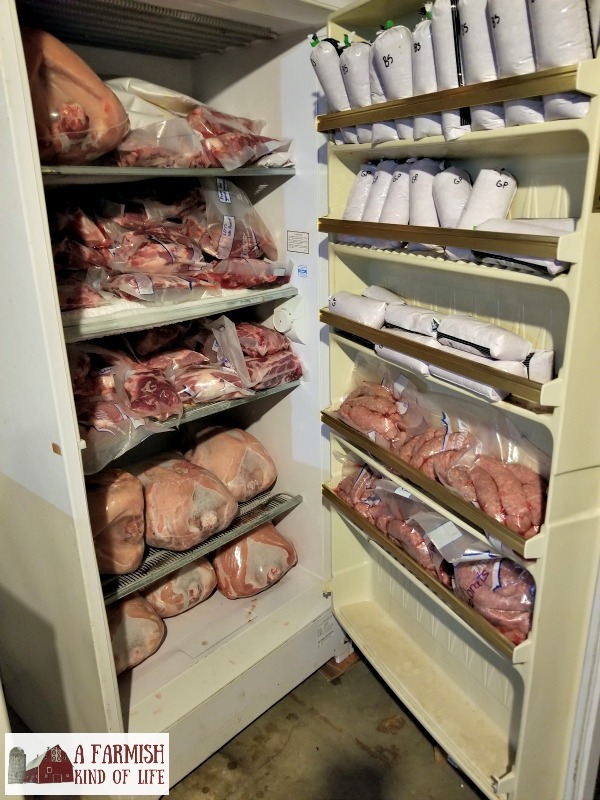 Whether it’s chicken, pork, rabbit, eggs, or other animal products like lard, make sure that food from the barn also makes up part of your day. 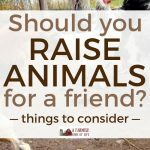 You’re raising those animals, right? They’re going into your freezer, right? This is what you should be basing your eating from—not frozen pizza from the store. Hopefully the meat/animal products come from your barn, but a local homestead or even the grocery store is great. Again, a pork roast or a whole chicken from the local grocery is better than basing your day around some frozen super processed conglomeration with 40,000 ingredients…right? I’m talking honey wheat bread, tortillas, yogurt, homemade spaghetti sauce, and chicken noodle soup with homemade noodles. I’m also talking about treats like carrot pie, homemade pizza, and Amish Cinnamon Flop Bread. See, my downfall in healthy eating has always been this: I rock in the kitchen. I’m generally a pretty humble person, but I should have a crown and a sash for some of the stuff that I’m rolling out of my oven. The problem? I’m not supposed to eat most of that stuff if I’m eating healthfully. I mean, tell most people you make homemade bread and they will look at you like you’re so 30 years ago and haven’t heard that people just don’t eat bread anymore. And the more I think about this, the more framing my way of eating as the homesteader diet works for me. The good stuff from the garden and the barn gets eaten (first, please) and it allows for the “stuff from scratch”. And, yes, that could refer to homemade macaroni and cheese—but how much homemade macaroni and cheese am I going to eat (and how often am I going to eat it) when it takes 30 kazillion hours longer to make than boxed stuff? For most of us, baking a pie requires time and love and all sorts of goodness and I like to believe that’s a big part of why it tastes better. But how many ice cream caramel rolls am I going to make when it’s too hot to bake and I don’t want to heat the house up? Do you drink as much wine/mead/home brew when you made it yourself? No, because your supply is finite—and it’s a lengthy process to make more. 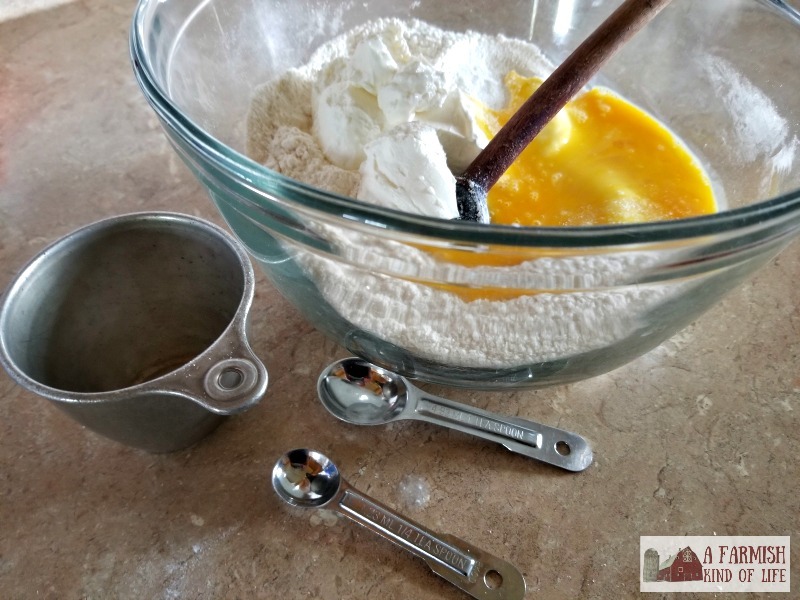 When you have to go through the work of making stuff from scratch in your kitchen, you will likely find that some of the items you binge on (when they’re convenient to purchase at the store) aren’t consumed as often. Homesteaders are in a position to create the food they’re eating. Isn’t it awesome that you have control over what you eat—especially when you’re raising and growing and cooking it yourself? And you know that your food tastes better. You know it. Take pride in your part in creating those meals. So ask yourself: Did I grow this? Did I raise it? Did I make it? And when you can answer yes, how awesome is that? This doesn’t mean you should feel guilty when you don’t have the option. It means just make it the first option when you can. The homesteader diet is about actually using the stuff you raise, grow, and make. Oh, young grasshopper. You have much to learn. Because when you’re up to your elbows in eggs, the last thing you want to eat is eggs. 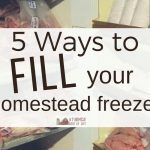 Maybe it’s just me and the people I know, but there are many homesteaders who get that life they’re craving and then forget how awesome it is. And let’s be honest—it’s easier to go to the store. It might be further to drive, but it’s easier to grab a package of whatever and pay for it and bring it home and put it in the freezer or fridge or pantry. 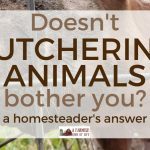 It’s the ultimate irony as a homesteader. Growing and raising amazing food and being too busy to prepare it. I will come completely clean with y’all and tell you that this totally describes me some of the time—and I need to do better. The homesteader diet causes you to slow down. I have a theory that eating crappy food became easier when the crappy food choices became more convenient. A lot of less healthful choices (like desserts) take a long time to make from scratch. And because of that, you probably wouldn’t make them as often. And if you do make them, you probably won’t binge eat them because you know the work that went into them. Ok, I’ll fess up. There is nothing like a warm loaf of bread with butter…but you know what I mean. The homesteader diet is not about losing weight. It’s about being healthy. If you’re thinking hey, I’ll start eating like a homesteader because I want to drop ten pounds…please stop. When we put deadlines or numbers on anything having to do with our eating/weight, it can be sabotage. I know very few (read: almost no one) who has started a “diet” and had it work for longer than the two weeks they needed to squeeze into the dress they bought for their cousin’s wedding. Stop putting a deadline on your goal. Pace yourself. We want to be turtles here, not rabbits. Rabbits get burnt out. This doesn’t have to be complicated—just make good choices most of the time. Eat from your garden, your barn, and your kitchen. Enjoy the things you’ve helped to create. Go back to enjoying food. Seriously. If you meet a friend for lunch and she offers you cake or you’re out with kids and come across an ice cream shop, this is not going to ruin you. Seriously. A big reason people give up on a more healthful lifestyle is they make it too restrictive. And while there are folks out there who can benefit from some major quick work on their health, for most of us slow and steady is what’s going to win the race. Focus most of your eating on the garden, the barn, the kitchen and you’ll get there. 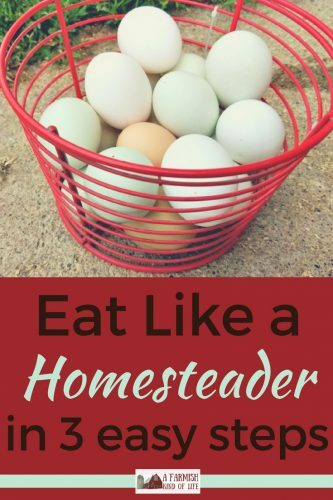 Thinking about the homesteader diet is simply a mindset to keep you focused on the fact that you’re living in the middle of an elite grocery store. You’re so blessed to have the opportunity to do the things you can do. Some people would love to have what you have. So let’s start living—and eating—like it. LOVED this episode of the podcast! You echoed so many of my own thoughts!!! 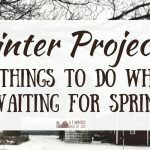 Even as a “not-yet” homesteader, I can apply many of the same principles to my own diet and cooking routines! I also “struggle” with being too good in the kitchen for my waistline! 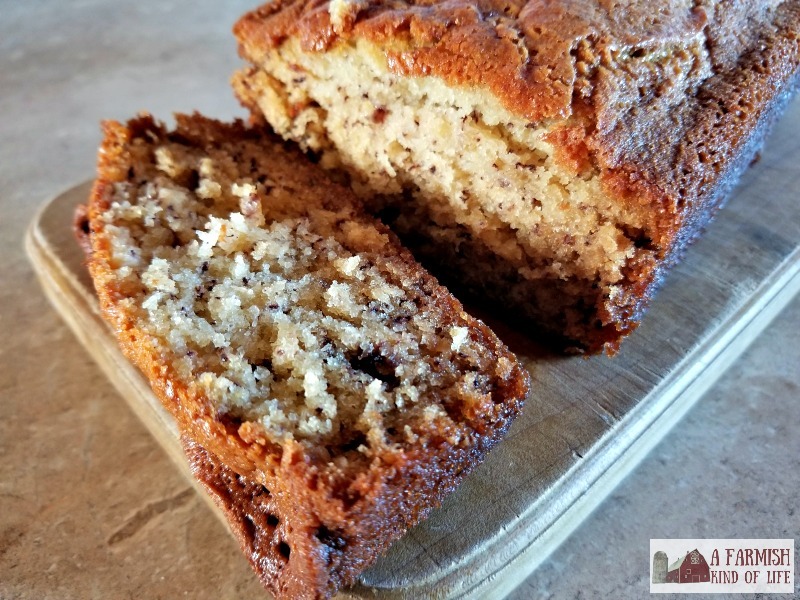 I’ve been on a weight-loss journey for the last year, so it’s been hard not to bake as often as I would like, but it has been alot of “eating from the garden and the barn” (even when it’s not my OWN garden or barn). Similar to the idea of “if I don’t have *time* to make it from scratch, then I won’t eat it right now”, is the idea of “if what I bake/make from scratch is higher in calories than I would like to allow myself for that treat, I either need to decide whether 1) I want to simply be in excess of my “necessary” calories for the day (which is PERFECTLY OKAY once in a while! ), 2) I am willing to sacrifice something else to enjoy this home baked treat, or 3) maybe I don’t need the buttery scones at all today because it will save me the calories and I can make a healthier (and quicker) choice of homemade yogurt with berries. “It doesn’t have to be complicated.” AMEN! I’ve lost 50 lbs eating simply and simply eating according to my body’s caloric *needs*. No shakes, no programs, no plans! Very nice post! Whole foods here! Most of the time. Got my first eggs from our chickens the other day, that was exciting! Great tips. 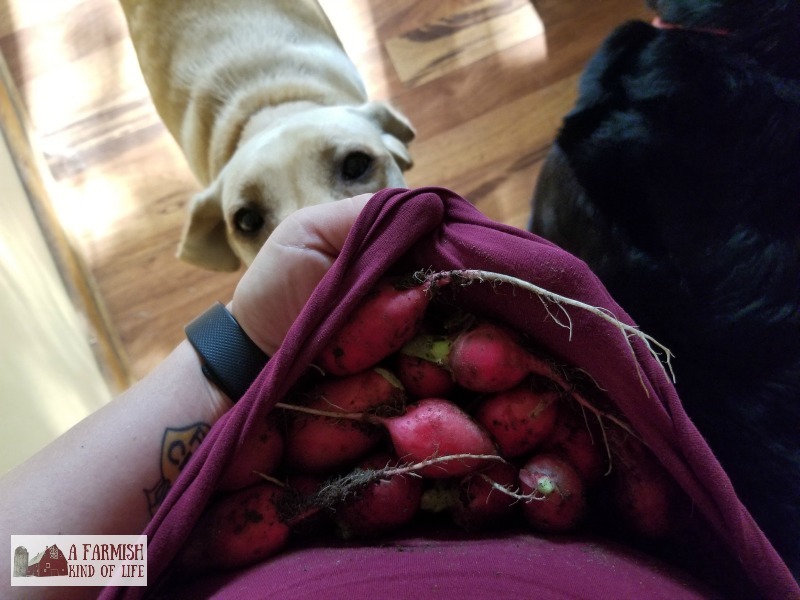 Though I haven’t quite hit homesteader status yet, I do love eating produce out of my garden and baking and cooking all kinds of meals from scratch.